We encourage all of our fans to watch the new season of Independent Lens on Mondays at 10pm on PBS. The series begins October 8th with As Goes Janesville. Earlier this year, the successful PBS Needs Indies campaign saw filmmakers and fans unite in support of independent documentary on PBS, urging them to reconsider scheduling and promotion for Independent Lens and P.O.V. You made this new timeslot happen, so we hope you can spread the word about it! 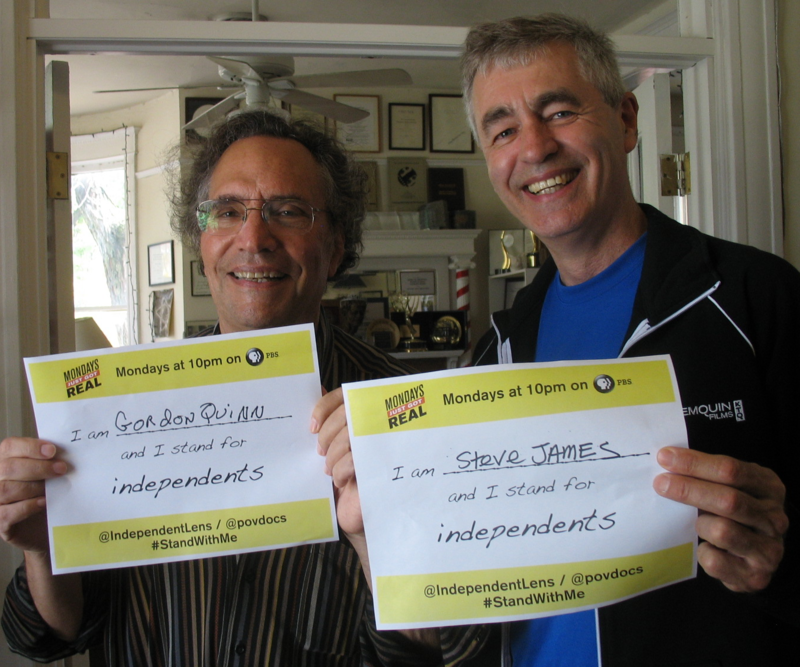 Independent Lens and POV are asking filmmakers and public media fans to pledge their support for the Monday slot and for indies on PBS. Read a message from ITVS President and CEO Sally Jo Fifer asking for "your help in the long haul to drive audiences to Monday nights. We know through audience research that once viewers tune in to Independent Lens, they stay tuned in—so we just have to get them there!" Kartemquin's Gordon Quinn and Steve James show their support in this video. 1. Download the #StandWithMe card. 2. Write your name. Have someone take a photo of you holding it. 3. Tweet it using #StandWithMe. Facebook it. 4. Submit it to Tumblr! The 11th season of Independent Lens features 22 documentaries— "including new work by Academy and Emmy Award-winning filmmakers, five 2012 Sundance Film Festival award winners, and festival favorites from SXSW and Tribeca." I stand with independents. #StandWithMe. Mondays on @PBS. remember: tune into Independent Lens, Mondays at 10pm on PBS.